So just what have I accomplished this year? A fair bit, I think. The last 12 months on blogging have had a sporadic structure, with a lot of ad hoc entries and later evolved into having articles propers. 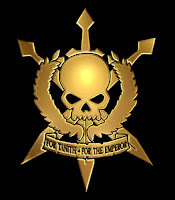 I have produced around 20 rules entries, with one for every race bar Daemons and Necrons, who are harder to write for in some ways. I have reviewed 3 FW entries, created a new army structure which I hope to get back to and modify further at some point, created 2 scenarios and some minor work. Crazy work hours have kept me from really contributing to The Codex Project in the capacity I would like to but periodic visits to the forums have brought this gem to my attention. I really love the Adeptus Arbites. They are the most blatant rip-off GW has ever stooped to (and they've got some light fingers when it comes to sci-fi IP) - a Judge Dredd clone transplanted to the 40k universe. Ruthless, uncompromising, just - the Arbites are a beacon in the fog of corruption that roils across the Imperium. 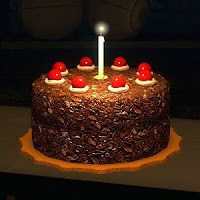 Well, it's been one year since the inception of this little corner of the blogosphere, so now I've lit the cake I'll have a bit of fun making rules for Our Glorious Leader. The intelligence gathered on the mysterious figure known as Atrotos reveals very little. It is clear he studied on Mars and joined an expeditionary fleet, but after that the fleet went missing in the Warp and records became vague. Years later he resurfaced into the world accompanying regiments of traitors and servitors, whom he orders around using wireless relays in their brains. His equipment is unheard of and strange, with armour that seems to possess rudimentary AI that goes far beyond the capabilites of a regular Machine Spirit. Recent 'evidence' linking him to the force known as the Stellan Hoplites is pure conjecture. Atrotos may be taken as a HQ choice in an Imperial Guard army, or with a Stellan Hoplite army with at least three squads of Cataphracts.